There are two primary species of whiteflies in greenhouses, the greenhouse whitefly (Trialeurodes vaporariorum) and sweet potato whitefly B-biotype (Bemisia tabaci), formerly called the silverleaf whitefly (Bemisia argentifolii). The bandedwinged whitefly (Trialeurodes abutilonia) occasionally enters greenhouses in the fall and is not an important pest. A new biotype of B. tabaci, the Q-biotype has demonstrated resistance to a number of commonly used insecticides for whiteflies including imidacloprid thiamethoxam, acetamiprid and the insect growth regulators buprofezin and pyriproxyfen This biotype also vectors leaf curl virus in tomatoes. Greenhouse whitefly adults have wings and are 1/16" long. Adults hold their wings flat and parallel to the top of their body. In contrast, sweet potato whitefly B-biotype adults are yellow and smaller than greenhouse whiteflies. Their wings are held tent-like over their bodies. Adult females live up to six weeks, and can produce up to 200 eggs, usually laying them on new plant growth on the under sides of leaves. 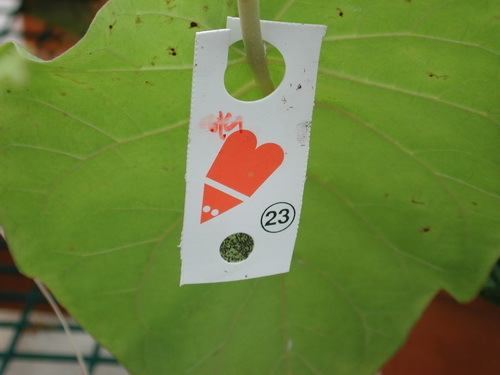 Greenhouse whitefly females lay more than 20 eggs in small circles, while sweet potato whitefly B-biotype females lay their eggs randomly in small clusters on plant leaves. The eggs of both species are upright and spindle-shaped, attached to a short pedicel. Newly laid eggs are white. Greenhouse whitefly eggs eventually turn gray while those of the sweet potato whitefly B-biotype turn amber-brown. Greenhouse whitefly eggs hatch in four days while sweet potato whitefly B-biotype eggs hatch in seven days at temperatures between 65-75F. The newly emerged nymphs of both species are very small and oval shaped. Young nymphs have legs and antennae and move short distances before choosing a place to settle and feed. They remain in the same place until emerging into adults. More mature nymphs (third and fourth instars) are typically found on lower leaves. Another method used to identify the different species is by examining the pupal stage. The pupal stage does not feed and has distinct red eyes. 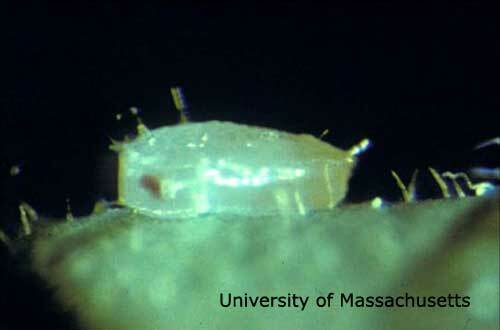 Greenhouse whitefly pupae are white and have waxy filaments around the edge of their bodies. Sweet potato whitefly B-biotype nymphs do not have waxy filaments and are yellow in color. Winged adults emerge from pupal cases in 1-2 weeks leaving T-shaped openings. These empty pupal cases remain attached to the leaf surfaces and are sometimes mistaken for live whitefly nymphs. Adult females begin to lay eggs 2-3 days after emergence. Development from egg to adult takes 14-40 days depending upon temperature, host plant and whitefly species. Greenhouse whitefly adults are more active at temperatures of 75F while sweet potato whitefly B-biotype adults are more active at temperatures greater than 80F. The life cycles of both whitefly species are similar, consisting of eggs, nymphs, pupae and adults. Whiteflies are the major pest of poinsettias and greenhouse tomatoes, and they feed on many annuals, perennials, herbs and vegetable bedding plants. They are not able to survive outdoors during winter in Massachusetts. Plant material located outside may become infested when winged adults migrate out of greenhouses through openings as outdoor temperatures increase. Whitefly adults that are on weeds or other infested plants outdoors may migrate in greenhouses in the fall. Nymphs and adults are typically located on the underside of plant leaves. Both nymphs and adults have piercing-sucking mouth-parts which they use to feed on plant fluids. High populations can cause plant foliage to become yellow. Nymphs secrete honeydew (sugary sap) that serves as a growing medium for black sooty mold fungi. Sooty mold reduces photosynthesis and severe infestations may defoliate plants. 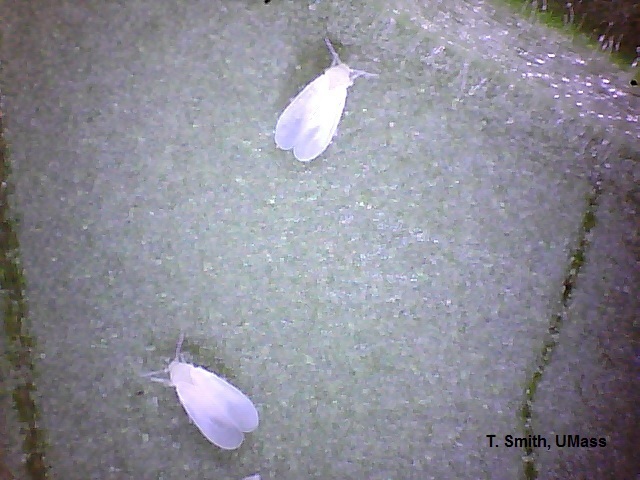 Whiteflies should be monitored by using yellow sticky cards and by inspecting the undersides of leaves for eggs, nymphs and pupae. Yellow sticky cards used at a rate of 1 per 1,000 sq. ft should be positioned just above the crop canopy and replaced each week. Use more sticky cards when growing susceptible crops and use additional cards under benches, and near doors and vents. The sticky cards can be moved vertically as plants increase in height. The number of adult whiteflies should be counted on sticky cards each week and recorded. This information can be used to decide if natural enemies or insecticide applications are needed over time. Clean greenhouses of debris, plants and weeds between crop cycles. Pest populations will be reduced significantly with a fallow period of four weeks, but having an empty greenhouse for even two weeks can help. Inspect all incoming plants, including cuttings for adult and immature whiteflies. Keep weeds out by frequently inspecting under benches and around the perimeter of the greenhouse. Treat vegetation around the outside of the greenhouse with horticulture oil to suppress whitefly populations that may have escaped the greenhouse and are living on weeds outdoors and serving as hosts. Pesticides are primarily used to manage whiteflies directed at adults and nymphs through foliar applications or using systemic insecticides applied to the growing medium to manage nymphs. Whitefly eggs and pupae tolerate most insecticides except for horticultural oils, which kill all life stages by contact, provided there is thorough coverage. When using contact insecticides, repeat applications may be needed over a 2-3 week period depending on the population and residual activity of the insecticide. Translaminar insecticides may be effective for managing whiteflies for extended periods of time. Translaminar insecticides are systemic-like, pooling within the leaf. Systemic insecticides such as neonicotinoids should only be used on plants with a healthy root system and are best used on plants that are actively growing to increase uptake of the active ingredient. After application of a systemic insecticide, it may take several days to weeks before whitefly populations begin to decline. The use of insect growth regulators may be preferable early in the cropping cycle since many of these insecticides are compatible with whitefly parasitoids. For information on specific pesticides to apply, see the latest edition of the New England Greenhouse Floriculture Guide. If planning to use biological control, it is important to phase out the use of pest control materials with long residuals such as organophosphates, carbamates and pyrethroid chemical classes. Three parasitoid species are commercially available for controlling or regulating whitefly populations in greenhouses: Encarsia formosa, Eretmocerus eremicus (referred to as E. californicus in older publications) and Eretmocerus mundus. Each species has distinct advantages depending on the crops grown and whitefly species present. Mixtures of two parasitoids are commercially available through most biological control suppliers. Encarsia formosa: This parasitoid is most effective against the greenhouse whitefly, particularly in long-term (more than four months) crops such as tomatoes and cucumbers. Encarsia formosa is less effective on tomatoes with hairs or trichomes because the hairs make it difficult for the parasitoid to detect whiteflies and for adult females to lay eggs in whitefly nymphs. Adult female parasitoids also feed on young nymphs. Females lay eggs in nymphs; larvae emerge from eggs and consume the internal contents of the whitefly. Larvae eventually pupate, and emerging adults create a circular hole with their mouthparts, in which they use to exit from the parasitized whitefly. Parasitized whitefly pupae are black and easy to distinguish from un-parasitized pupae. Encarsia formosa is most effective at temperatures between 70–80ºF (21–26ºC), and 50–80% relative humidity. Adults do not fly when ambient air temperatures are below 65ºF (18ºC) and survival is reduced at temperatures >86ºF (30ºC). Remove yellow sticky cards before and after releasing E. formosa in order to avoid capturing adults on the cards. Replace sticky cards 3–4 days following release. Most E. formosa are commercially available as pupae glued to paper cards that can be hung directly on the plants. Suspend the cards in the lower canopy of plants to avoid desiccation from direct sunlight. Adults emerge from the pupae and fly upward. Introduce cards weekly starting when whiteflies are first detected. Continue making releases until 80% of the whitefly population has been parasitized. When scouting, look for the distinct black parasitized greenhouse whitefly pupae or the brown parasitized sweet potato whitefly B-biotype pupae. Encarsia formosa is very sensitive to sprays and even dried residues of many pest control materials including pyriproxyfen, spinosad, chlorfenapyr, acetamiprid and pyridaben. Eretmocerus eremicus: This parasitoid is used for controlling the B-biotype of Bemisia tabaci on poinsettia. This parasitoid tolerates warm temperatures since it is native to the desert areas of California and Arizona. In addition to directly parasitizing whitefly nymphs, E. eremicus adult females kill nymphs by host feeding, which may actually maintain whitefly populations at low levels. Eretmocerus eremicus attacks both the sweet potato whitefly B-biotype and the greenhouse whitefly. Eretmocerus eremicus is shipped as pupae that are either glued to paper cards or placed loosely in sawdust. If using pupae in sawdust, deposit a portion of the mixture in styrofoam coffee cups retrofitted with screen bottoms clipped to stakes that are attached 6-12" above the top of plants. Adult parasitoids will emerge from the containers. In order to avoid getting the pupae wet (moist), don't sprinkle the sawdust onto flats, and avoid watering the sawdust during irrigation since this will instigate the growth of mold that may impact adult emergence. Contact your biological control supplier for information on release rates. Prior to release, remove yellow sticky cards which will attract and trap emerging parasitoids. Replace yellow sticky cards four days after releases have been made. Optimum temperatures for development and activity are 77–84ºF (25–29ºC). The parasitoid is inactive at temperatures >86ºF (30ºC). When scouting, look for parasitized whiteflies. Greenhouse whitefly pupae are yellow while sweet potato whitefly B-biotype pupae are yellow-brown. In general, E. eremicus is more tolerant of exposure to pest control materials than E. formosa. Eretmocerus mundus: This is a relatively new whitefly parasitoid that only parasitizes the sweet potato whitefly B-biotype. Eretmocerus mundus is commercially available in blister packs, in containers, or as pupae attached to paper cards. When using blister packs, carefully open the flap on the back of the blister pack to expose the hole from which adults can emerge. Avoid exposing any of the commercially available products to direct sunlight. This parasitoid is active at a wider range of temperatures than E. eremicus. The predatory mite, Amblyseius swirskii feeds on whitefly eggs and nymphs as well as thrips. The predatory ladybird beetle, Delphastus catalinae, is typically not recommended due to cost and because the ladybird beetle requires whitefly populations higher than what would be acceptable to greenhouse growers. The entomopathogenic fungus, Beauveria bassiana, is also commercially available for control of whiteflies. Applications must be initiated before whitefly populations are high. For long-term crops (5 months or longer) infested with greenhouse whitefly, releases of E. formosa are more efficient because this parasitoid reproduces better on greenhouse whitefly than E. eremicus, which tends to act as a predator by host-feeding on the nymphs. Once E. formosa populations establish in greenhouses, only occasional releases may be necessary. The use of E. formosa for control or regulation of greenhouse whitefly populations is recommended for long-term plantings such as in conservatories; greenhouse-grown vegetables such as tomatoes, peppers, and cucumbers, which require more than 20 weeks to complete production; or crops such as cut flowers since the foliage is not sold. In short term floral cropping systems (less than 4 months) with lower whitefly thresholds, or crops like poinsettia, releases of either E. eremicus or E. mundus are recommended. Both parasitoids act as predators by host-feeding on young nymphs, which may maintain whitefly populations at low levels throughout the cropping cycle. Releases must be initiated as soon as plants are potted or when they emerge as seedlings, and should be continued weekly during the cropping cycle. Research has shown that releases of E. eremicus are economically competitive with insecticides commonly used to control or regulate whitefly populations on poinsettia if applied at a rate of two pupae (1 female adult) per plant per week. However, initial whitefly populations need to be less than one nymph per cutting in order for the parasitoids to be successful. If more than one whitefly nymph per cutting is detected, then an insect growth regulator should be immediately applied to the crop. In addition to releases of E. eremicus, two applications of an insect growth regulator should be made after weeks seven and eight of the cropping cycle. Poinsettia (Euphorbia pulcherrima) crops are likely to be infested with whiteflies. The recommended control or regulation program combines weekly releases of parasitoids (the species will depend on the whitefly species) with two applications of an insect growth regulator. Eretmocerus species should be released at a rate of two pupae per plant per week during the entire cropping season. This is equivalent to one adult female per plant per week. Apply an insect growth regulator such as buprofezin twice, in weeks seven and eight, prior to bract coloring. However, buprofezin may not be effective if the population is predominantly the Q-biotype whitefly. If this is the case, then another insect growth regulator should be selected. Avoid releasing any parasitoids for 3–4 days after applying an insect growth regulator or other alternative pest control material. If the whitefly population is low (fewer than one nymph or pupa per leaf) in November and early December, then parasitoid releases may not be necessary. Regardless, continue scouting in order to detect hot spots or a general increase in the whitefly population. Ontario (Canada) greenhouse growers are experimenting with the use of a dwarf eggplant (Solanum melongena esculentum 'Baby Bell') to trap whiteflies in poinsettia crops. They disperse eggplants among the poinsettias at a rate of one plant per 1,000 ft2 at final spacing. It appears that the eggplants attract both whitefly adults and nymphs. In addition, greenhouse growers release parasitoids onto both eggplants and poinsettias, and observe high rates of parasitism on greenhouse whitefly. It is imperative to scout the eggplants to determine when to release natural enemies. Furthermore, it is undesirable for the whiteflies from eggplants to migrate onto the poinsettias. Although the greenhouse growers detect sweet potato whitefly B-biotype adults on eggplants, immatures are rarely found. However, greenhouse growers have indicated that biological control has been successful even without using eggplants. To implement this program, start eggplants from seed rather than using field-grown eggplants that may be infested with TSM or other arthropod pests. It is important to examine poinsettia cuttings when potting. If whitefly nymphs exceed one per cutting, immediately apply an insect growth regulator. After two weeks, initiate releases of natural enemies. Avoid applying pest control materials (insecticides, miticides, and fungicides) because any residues may harm adult parasitoids. Although whiteflies are the primary insect pest of poinsettia, fungus gnats may also be a problem, particularly when cuttings are rooting. You can control or regulate fungus gnat larval populations with the entomopathogenic nematode, Steinernema feltiae or the soil-dwelling predatory mite, Hypoaspis miles (Stratiolaelaps scimitus), and/or the rove beetle, Atheta coriaria. These natural enemies must be applied before fungus gnat population's build-up to damaging levels. Manage whitefly populations in bedding plants with the parasitoid, Eretmocerus eremicus. Release 1–2 pupae per ft2 per week until the crop is sold or when whitefly populations are low. Apply an insect growth regulator immediately if initial whitefly populations are high as a result of introducing whitefly-infested plants into greenhouses, or if you have not removed weeds or left-over plants from the previous crop. Wait at least 3–4 days before releasing E. eremicus into the greenhouse. Regularly scout the crop to expedite parasitoid releases. Other pests that may be encountered in bedding plants include thrips, fungus gnats, spider mites and aphids. In general, these pests can also be managed with natural enemies. Greenhouse tomatoes are most often infested with greenhouse whitefly, although they can also be infested by sweetpotato whitefly. It is important to identify the species to choose the correct parasitoid. Eretmocerus and Encarsia can be used individually or together, if needed. Encarsia formosa is used to manage greenhouse whiteflies. Application rates vary depending on the whitefly population. Suppliers provide detailed instructions for the release and rates based on specifici situations. In general, a typical program would include weekly releases of about 0.3 per sq. ft. at planting, increasing to 0.4-0.6 per sq. ft. either when whiteflies are first seen or as needed. Note that lower leaves on the plants may contain parasitized pupae, so take care when trimming plants that you do not remove lower leaves before adult wasps have emerged. When monitoring, look for black parasitized whitefly pupae and/or probe marks which typically appear within four weeks of the first release. Probe marks are dark spots on the backs of the pupae made by the parasitism. These dark spots can be seen using a handlens. Cloyd R., Kansas State University. 2012-13 New England Greenhouse Recommendation Guide, A Management Guide for Insects, Diseases, Weeds and Growth Regulators: Section B: Integrated Pest Management and Insect Biology. Information on ordering the current New England Greenhouse Floriculture Guide. Hoddle, M. 1994. Encarsia formosa: A parastic wasp that attacks whiteflies. UMass Floral Notes 6(5):5-7. Hoddle, M., R. Van Driesche, S. Roy, T. Smith, P. Lopes & J. Sanderson. 1996. A Grower's Guide to Using Biological Control for Silverleaf Whitefly on Poinsettias in the Northeast United States. University of Massachusetts Cooperative Extension System Floral Facts. 4pp.